Playgrounds, Play Areas, Adventure Parks and more! 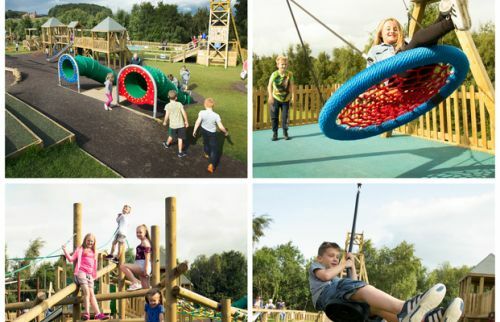 With huge adventure playgrounds, kids will absolutely love how much there is to do at Cannon Hall Farm. Pyramid towers, thrilling slides and awesome climbing frames will keep your little ones entertained for hours. The puzzling tube maze is the largest one in Europe and popular with the older kids too, it’s the perfect place for a game of hide and seek! Younger children have a special play area too, with plenty of equipment tailored for toddler-sized hands and feet to explore. Please note that age and height restrictions apply to some equipment. Magna has two fantastic playgrounds; go all out at SCI-TEK where children of all ages can explore and learn through play, with textures, colours and lots to discover. AQUA-TEK comes with it’s own splash warning, as it’s an adventure in all things water! SCI-TEK: Kids can bounce their way across multiple trampolines or get a little dizzy as they spin around on the spinning bowls and tilted roundabouts. Twisting slides, out-of-this-world rockets and castles fit for a king and queen make Magna’s playground quite extraordinary! 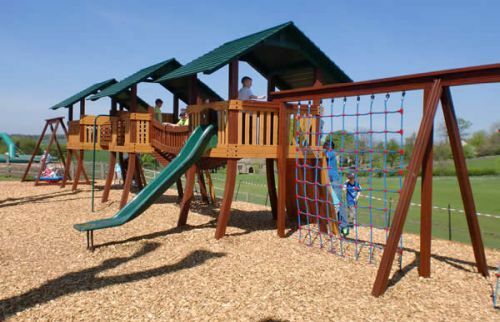 Magna has special prices for outdoor play areas. Little monkeys will have a whale of a time both indoors and out at Yorkshire Wildlife Park’s variety of play areas. Kids can become a ‘jungle VIP’ swinging around in Monkey Playhouse with a fab selection of slides, handcrafted walkways and wooden baboons! The Zoom Super Slide Barn does exactly what it says on the tin – with a 20ft vertical slide, it’s one for the adrenaline lovers! Make sure that your children are wearning long sleeved tops, long trousers and socks to avoud friction burns. Outside kids can play on the Big Bugs Play Area with a giant pyramid tent that’s perfect for picnics, whilst your children play on the Giant Bugs. Or head over to the Oasis Adventure Play Area which is fun for all ages! Zoom down the zip line, whizz down slides and clamber up the climnbing frames. The ALL NEW Jungle Lookout play area lets children climb and swing like the lemurs inside giant wooden tree forts. Obstacle courses, slides and wooden jungle huts make for great fun! 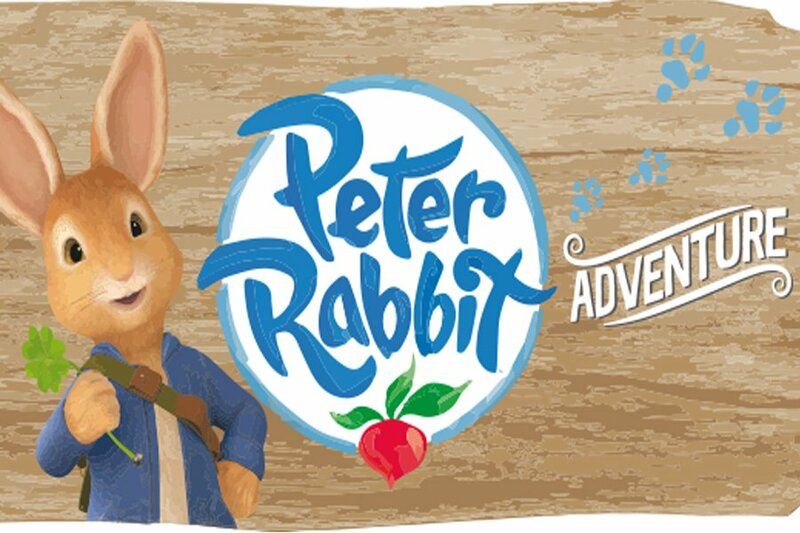 Hit CBeebies animated series Peter Rabbit has arrived at Flamingo Land Resort with an all-new Peter Rabbit Adventure attraction. Kids can help Peter Rabbit find Pig Robinson’s missing Brussels sprouts, then join Peter, Lily and Benjamin in their Secret Treehouse. Or how about a musical adventure? Hop along to Jeremy Fisher’s musical pond to explore giant instruments and learn about sounds from the giant lily pads. 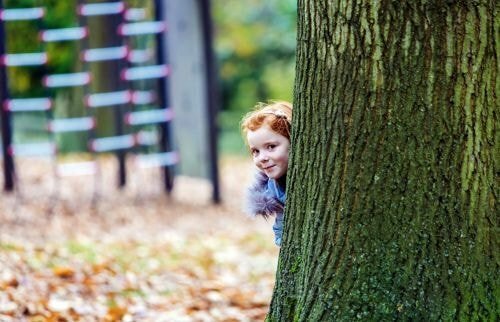 Children of all ages can enjoy the amazing Adventure Playground in the beautiful grounds of Harewood House. An adrenaline-fuelled whoosh down the zip line is great for older kids, whilst swings and slides are fun for everyone to play on. 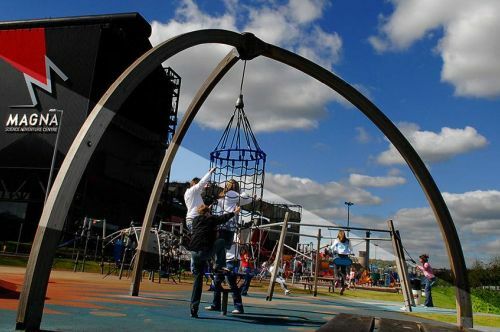 Children can explore the aerial walkways and climb to their hearts content on the climbing frames. The playground, open daily from 10am – 5pm, located at The Hepworth Wakefield has a zip-wire, pirate ship, swings and climbing frame for young children to let off some stream once they’ve explored the gallery. The gallery are working to create one of the UK’s largest free public gardens. 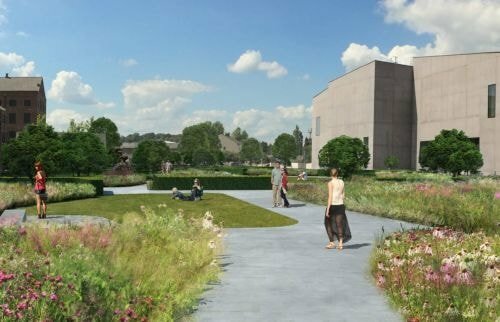 The garden, measuring approximately 6000 square metres, will be developed in the space between The Hepworth Wakefield’s building and neighbouring Victorian mill buildings. 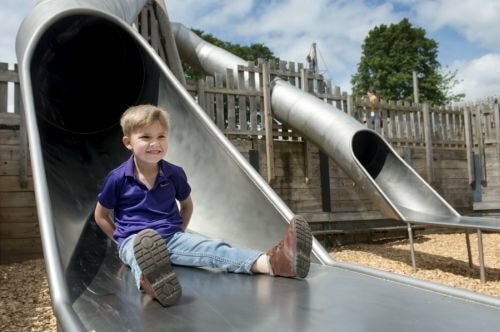 New for August 2017, the Adventure Playground has plenty to keep the kids entertained including a Pithead zipwire, roundabouts, swings, slides, climbing frame, Jungle Towers, Adventure trail and an infant area. Outdoors and Indoors play areas make for a great play date; the Play Barn has ride-on tractors, giant slides, sandpits and a tots play area. 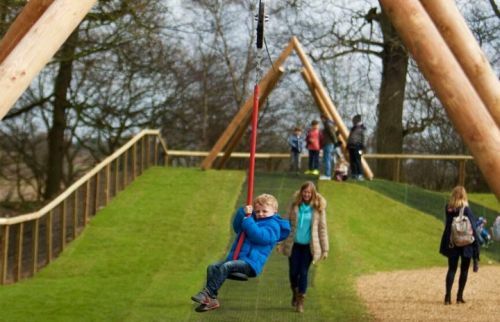 Outside, kids can explore the playground with a climbing frame and wooden lookout huts! A fun day out at Eureka! isn’t limited to being indoors. 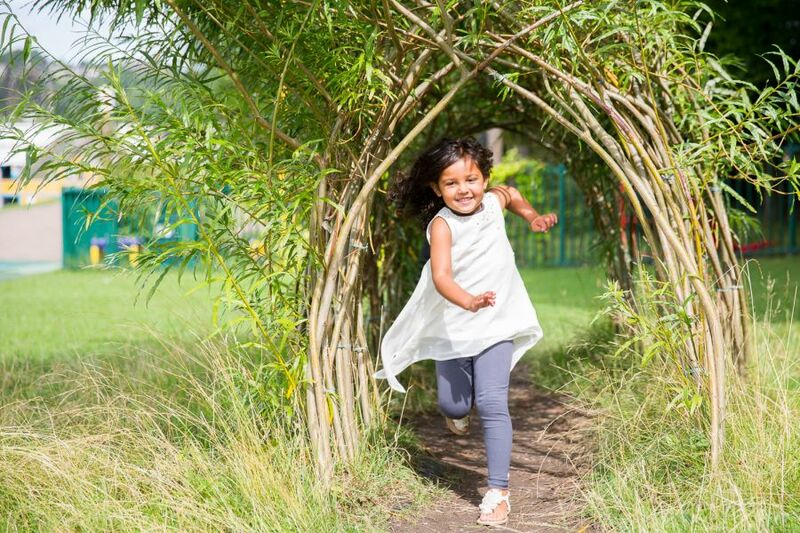 From an enormous sandpit and play equipment to a wonder walk in the sensory garden and nature experience, there is plenty to keep the whole family entertained outdoors. What’s more, there will be loads of events running outside throughout the summer, including giant bubble making, interactive storytelling, pirate challenges and science busking.